Here at We Are Explorers, we’re all business. 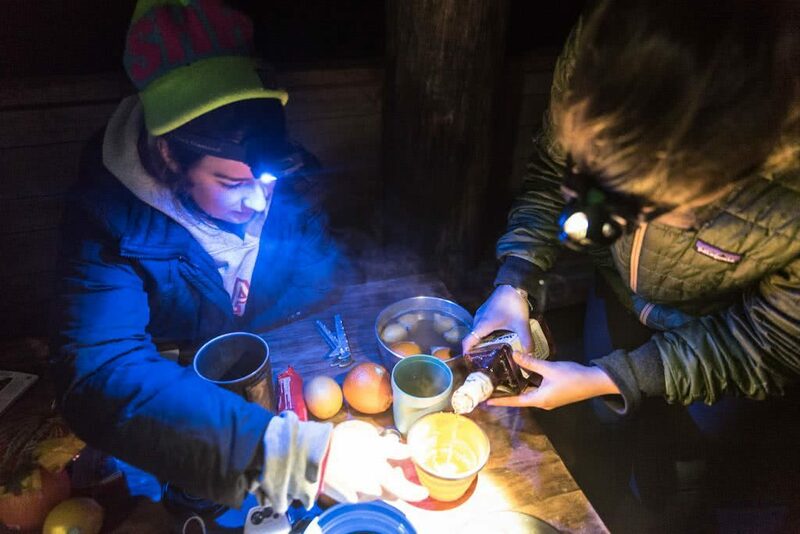 That’s why, when we got the call to test out some head torches, our first thought was “get the clipboards and someone make a spreadsheet.” Absolutely no time for fun and games. We definitely didn’t take a trip down memory lane and play spotlight. We can also promise that we didn’t all turn on our torch’s strobes and have ourselves a four-person bush rave. And it would have been ridiculous for us to sneak up on each other with our lights off and scare the bejesus out of a fellow explorer. Ok, ok, the jig is up. That’s exactly what we did. 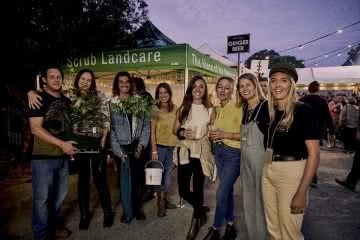 But what did you expect from a couple of bush monkeys? When talking bang for buck, this head torch has got a whole lot of bang but it’s also going to cost a fair few bucks with an RRP of $174.95. However, there is a reason for the hefty price tag. With 600 lumens, it’s in a league of its own. It shines brighter than my future, has an adjustable beam (both in brightness levels and beam width) and can tilt up and down. It also has a removable rechargeable battery, so you can hot-swap new batteries in on those longer expeditions. I used the Ledlenser MH-10 for a week on the Great South West Walking Track and while it worked wonderfully, it felt like overkill. 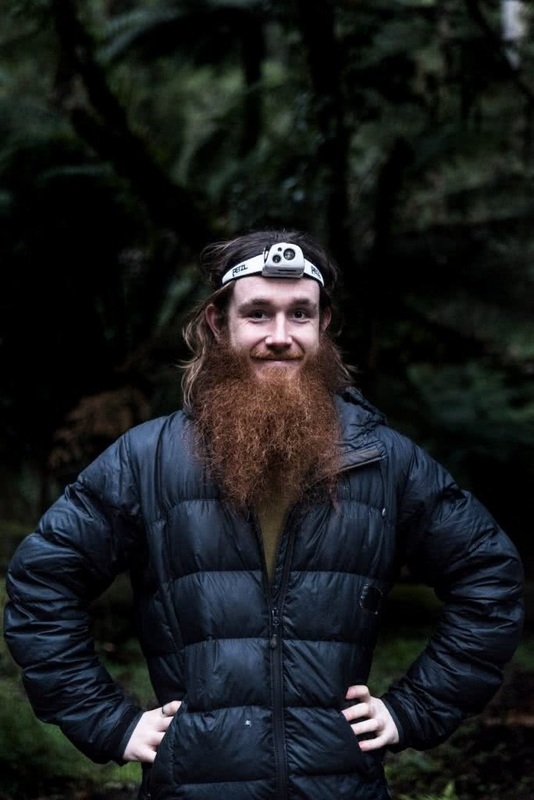 I had to switch it to the lowest light level most of the time as the other two were blinding to any other hikers within a 50m radius. However, when doing a bit of late night wildlife spotting, the strong beam and adjustable focus came in handy. Even with decent use over the week, there was no discernible drop in brightness (and it wasn’t even fully charged when I left). 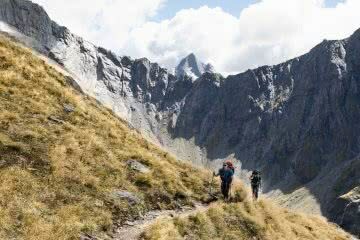 Weight is always a consideration when hiking, and while the LedLenser is a bit bulky with the battery pack on the back, it is actually quite light at only 158g. In the end, while it’s a great torch, it isn’t your “ghost stories around the campfire” or “once a year camping trip” kind of torch. It’s more of a specialist torch for caving, professional spotlight players, or those who are afraid of the dark. 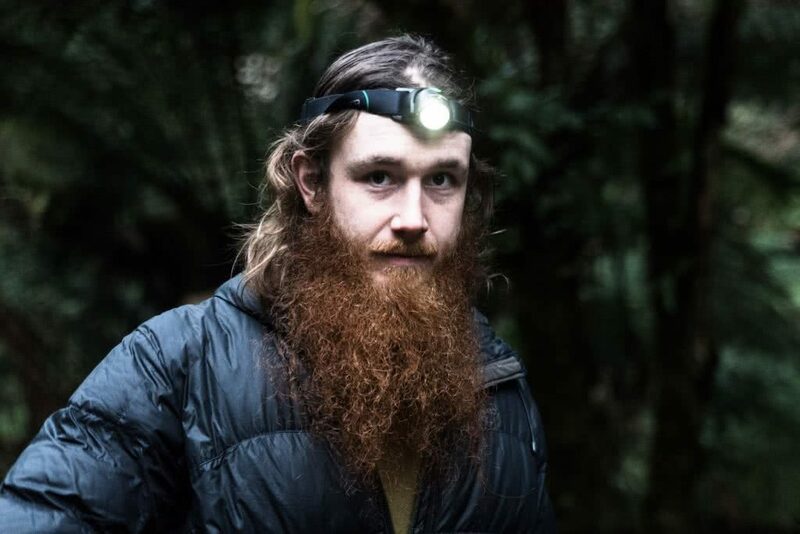 The Black Diamond Storm (2017 version) is a neat little head torch that provides everything the adventure-goer or night-seeker needs for those quick weekend rainforest benders or longer hiking endeavours. The battery-powered torch weighs about 110g with a comfortable adjustable head strap and numerous functional (red light, varying beam settings) and fun (red, blue and green disco light) features. 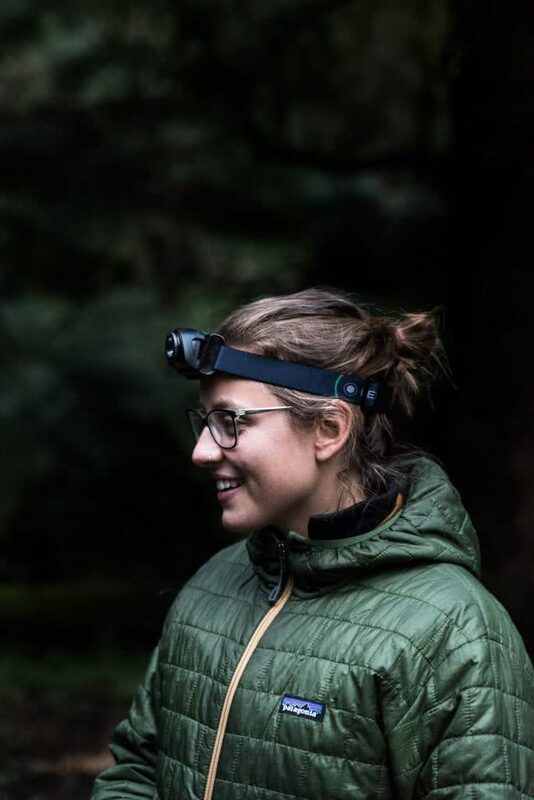 It’s no slump in the power domain, with this later iteration boasting an unprecedented 350 lumens and improved peripheral lighting which means it is both perfect for route finding after dark and close-range activities at the campsite like cooking, reading or sorting gear. Luckily for me, it’s also completely waterproof and dustproof, with an IP67 rating meaning it’s good for depths of up to 1m for 30 minutes. It got the tried and tested dunk test at home in a bucket and emerged as good as new (or as good as when it went into the water at least). It’s also got an intuitive secure locking mode, which prevents the light from accidentally turning on when stored in your pack or pocket. With a finite amount of battery power, this can be one of the most frustrating moments when out hiking and desperate for light. Thank you Black Diamond. Unfortunately, it’s not rechargeable, so you’ll still be relying on wasteful single-use batteries. There is also a slight learning curve to this one. With a bit of fiddling around you can figure out the main functions of the head torch but to dig deeper into the range of features on offer including strobe lighting, and secure locking mode, you might need to pick up the manual, or have a bit more patience than I did. If you’re looking for a jack-of-all-trades, this might be the one for you. Decent battery life, adjustable brightness and a red light all mean that it isn’t short on features. 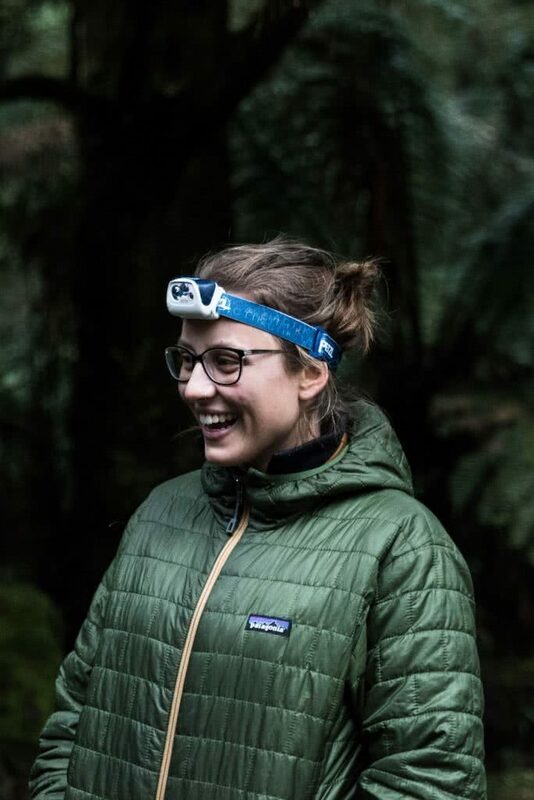 Furthermore, Petzl headtorches are known for their durability and while we didn’t go all out when testing this aspect, it seemed to stand up to the challenges thrown at it. A couple of drops here and there didn’t seem to faze it at all. Disappointingly, our model didn’t come with the CORE rechargeable battery pack that Petzl offer, but you can buy one separately. I think by now, these should just be standard, not an optional extra, especially if they have already made it for this model. To be honest, I also found it more confusing to use than the Black Diamond and Ledlenser models. This isn’t to say that it wasn’t manageable, just a bit less intuitive and took a bit of getting used to. As many of us know, jack-of-all-trades can also mean master of none. For any given activity, there is probably a head torch in this review that will do a better job. That said, if you want a torch that can take a beating and fit most needs, this might be the one. 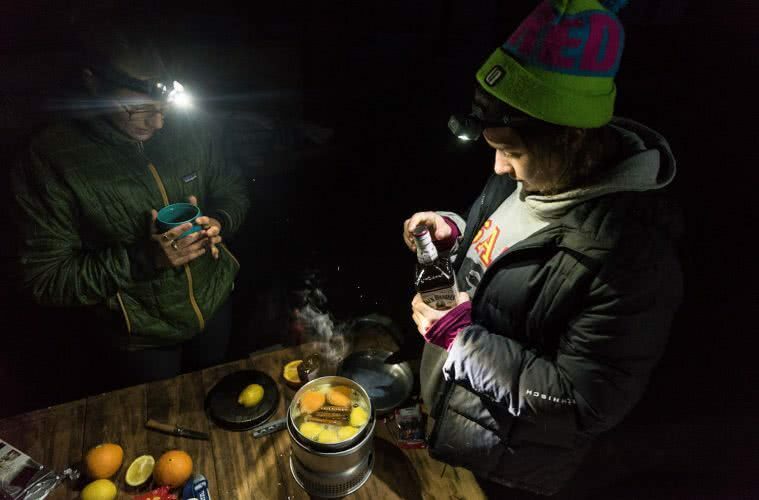 The Black Diamond Iota is a pocket-rocket of a head torch. It packs a punch in the power area and punches well above its weight in battery life for such a compact package. This bad boy is tiny, weighing in at only 56g. It may not have a focusing beam, different colours, internet connection or voice activation but it does have a bloody solid bulb and a long-lasting rechargeable battery. Aside from that, it has a button that turns the torch on and off and adjusts brightness. And that’s all I need. No operators manual or three-year degree necessary for this simple piece of kit. It’s the perfect torch to keep on hand as a backup, bring along on trips in case your mate forgets theirs, or keep in your car for emergencies. While not the brightest out there, 150 lumens is plenty for your average Joe Camper. The biggest issue that I have with this head torch is that it may ruin every other torch out there for me. I can’t think of another that is as light, simple and practical. However, it does fall short on the durability front. The Iota can take a splash or two, but a proper dunk could send it to head torch heaven. It also doesn’t take any disposable batteries like some other torches. So when the rechargeable batteries run out, it’s out of action until you can charge it via its USB port again. With this torch, the ratings really don’t tell the true story. It scores low on features but makes up for it in simplicity. Its beam isn’t the brightest but it gets the job done. Where it really shines (get it?) is how light it is and how easy it is to use. The LedLenser MH-6 is a powerful and versatile head torch. It has a great battery life, an IPX6 waterproof rating and a smart beam focusing system. It has one recessed button that requires a firm push and a lock feature to stop it turning on in your bag. It weighs only 93 grams and the adjustment straps make it easy to fit and resize. I fell asleep with it still attached to my head, so I rate it for comfort. On the price scale, it sits between the upper end hobby torches and lower range of the extreme torches. My favourite part of the torch is the design. I have owned many head torches over the years and this torch overcomes the way the rest failed. The MH-6 binds the battery against your forehead and allows the light to tilt on its own. With every other torch I have owned, the whole body, including the battery, had to tilt. The body attached to the head strap by a flimsy plastic hinge which broke under the weight of movement. The MH-6 doesn’t flap about and it feels solid. It inspires confidence for activities in the dark that need your attention or hands. A simple twist transforms the light from a diffuse torch to a narrow and powerful spotlight. In a field test, the MH-6 was a brighter spotlight than the diffuse CREE LED headlights I use cycling in the forest. This torch would be useful for spotting wildlife in trees. 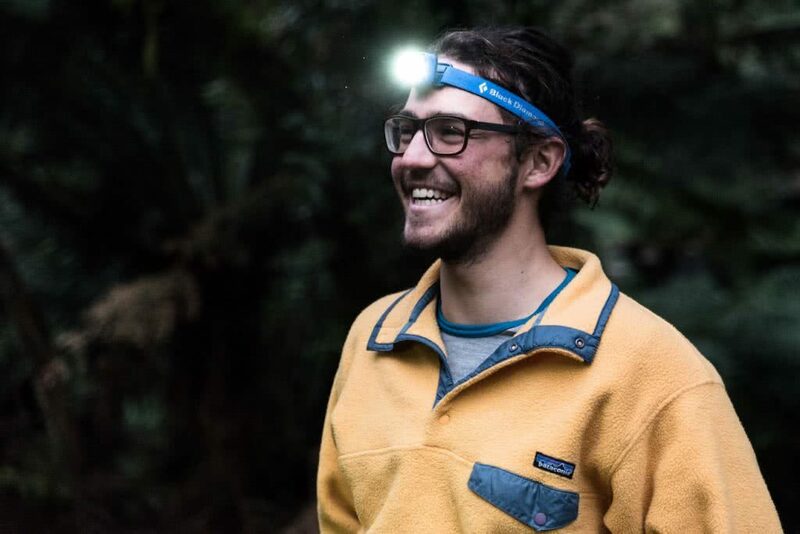 The Petzl Reactik, in addition to a very clever name that riffs off its older brother the Actick, boasts a range of features that on paper, look like a step up for a head torch $50 dearer than its counterpart. For the extra dosh you can expect reactive lighting that adjusts to your surroundings, USB rechargeable batteries and about 20 extra grams. I’ve dabbled in reactive lighting in the past while mountain biking and trail running at night and while it definitely does what it says on the package (adjusts the light to the surroundings) I’ve mostly come away wondering if it’s a bit of a gimmick. With “reactive” worked into the name and a big sensor giving me spooky third-eye vibes, I went to the Reactik expecting conversion. Alas, I’m still not convinced. There’s still a lag when you look from, the bush down to a map, meaning that you’re blinded by the reflection before it adjusts. I struggled through this for two nights before starting to double-click through to “standard mode” habitually. Unfortunately by this point I’d used up a fair chunk of the battery, brands often claim reactive lighting is “more efficient” but unless you’re constantly running your torch at higher brightnesses than necessary, this doesn’t seem to be the case. To be fair, the light output is excellent, up to 220 lumens is more than enough (though less than its more basic counterpart) and the mixed beam ensures an even spread of light. Also, damn, this thing is comfy! Petzl have used their patented double strap that looks like the back of a pair of swimming goggles, it keep the torch rock steady. I was initially worried that the plastic clip (a style much derided by Aidan in his Ledlenser review) would allow the torch to flip down, but I couldn’t make this happen even with vigorous headbanging. Unfortunately these ergonomics are ruined by the two weird and fiddly buttons that operate it. I’m sure with practice these would become second nature but good luck if you’re wearing gloves. While I’m all for rechargeable batteries, the one in the Reactik can’t be replaced by normal batteries. I think I speak for everyone in the outdoors when I say that this is annoying but USB battery packs are starting to become the norm on longer expeditions. 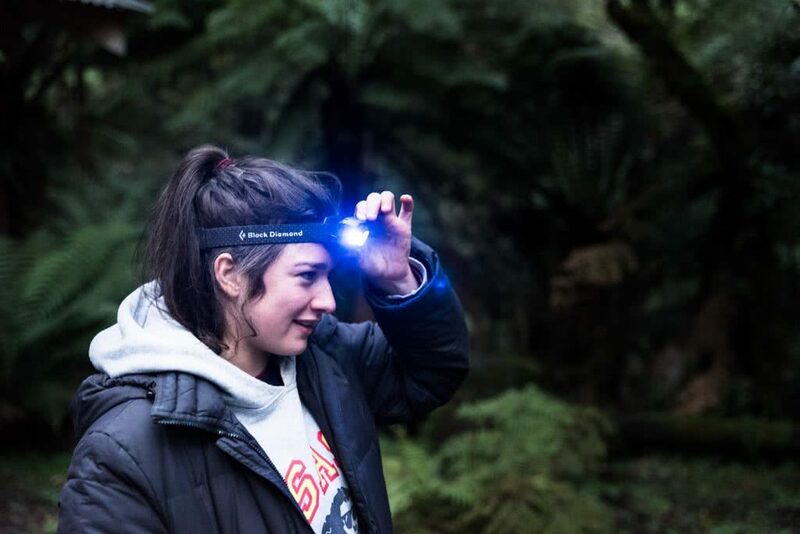 The Reactik ticks alot of boxes but ultimately, head torches are best when you forget you’re wearing them, something that never quite happened while I was wearing it. Just like Mum and Dad, we don’t play favourites. Instead, want to provide you with everything that you need to know to choose the right one for you. None of these head torches does it all and they’ve all got their benefits and drawbacks. Depending on whether you are a microadventure King or an extended expedition Queen, a different torch will be the one for you. 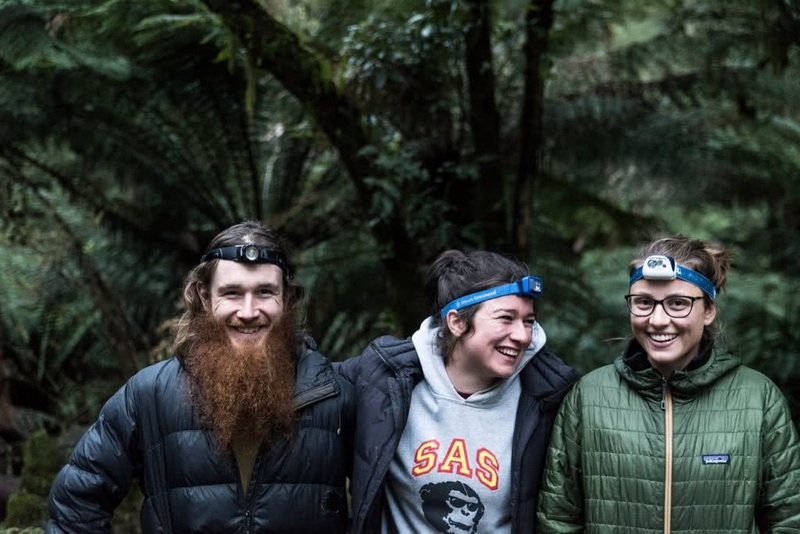 In fact, if there is one conclusion we can make from the weekend testing these torches, it’s that there is no better way to spend a few days than mucking around with your mates in nature. So the most important decision you’re going to make regarding a light to slap on your noggin is the decision to get out and use it. Go forth and adventure, my fellow bush monkeys. For the record, we were given the Black Diamond and Ledlenser head torches but had to return the Petzl ones. Patrick is studying a degree in science with an interest in the environment and climate change. However, you’re much more likely to find him as far away from university as possible. 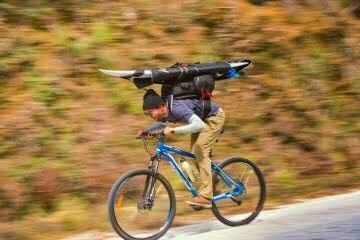 He’s preparing for a yearlong (minimum) jaunt around South America and North America.